It’s the most wonderful time of the year! And with the holidays fast approaching, many of you may have a trip scheduled to visit family, friends, and other loved ones. 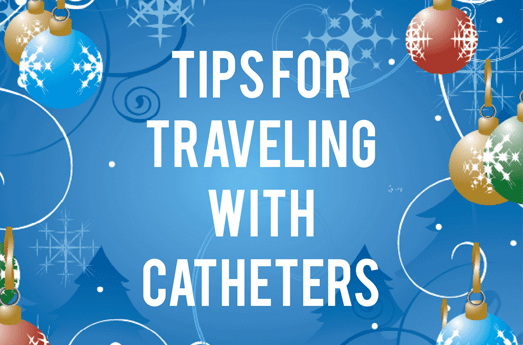 For those of you who self-catheterize or are a caretaker for someone who must use intermittent catheters, you may have some concerns about the journey ahead – whether by plane, train, or automobile! We here at 180 Medical want to offer you some tips for your holiday travels! Prepare for TSA security when flying. Remember the 3-1-1 rule for carry-on luggage. If you are carrying a separate lubricant, sterile water/saline, or disinfectant, it is safe to bring aboard the airplane as long as it is 3.4 oz or less in volume. It must fit in 1 quart-sized clear plastic zip-top baggie. Only one bag per passenger is allowed. If you are bringing catheters in your carry-on luggage, any lubricant, sterile water packets, etc., will need to be included in the quart-size baggie. If you’re scheduled for a longer trip, it may be best to put larger volumes of liquids in your checked luggage. Keep adequate stock on hand. Before you head out on your trip, you’ll want to make sure to pack enough catheters and any other related supplies with you in your luggage to last throughout the trip at the very least. It may be advisable to include a few extras in case of an emergency or any unexpected delays due to the weather, etc. If you’re planning on an extended stay at your destination, consider shipping your supplies there instead of checking them in your luggage. This not only frees up space in your suitcase for clothes, presents, souvenirs, or other personal items, but you can also make sure you have the supplies when you need them — no need to worry about your luggage getting lost or delayed. If you know in advance where you’ll be staying, you can even request your next order from 180 Medical to be shipped to your destination’s address (in the U.S.A.). Talk to a 180 Medical Product Specialist about trying out a travel-ready catheter. When you’re traveling, you’re making a lot of stops in public restrooms, hotel rooms, etc., and a sterile environment just isn’t a guarantee! Consider trying an intermittent catheter that is specifically designed to be “touch-free” and travel-ready, like a closed-system or a pre-lubricated catheter (depending what your insurance covers). Often these catheters also include insertion supplies like antiseptic wipes and gloves to further reduce the risk of UTIs. Give us a call today to discuss your options with one of 180’s trained specialists at 877-688-2729. For personal tips on airline travel, check out Bill’s article from earlier this year. Bill has been using catheters for years and has plenty of experience traveling as a person in a wheelchair.